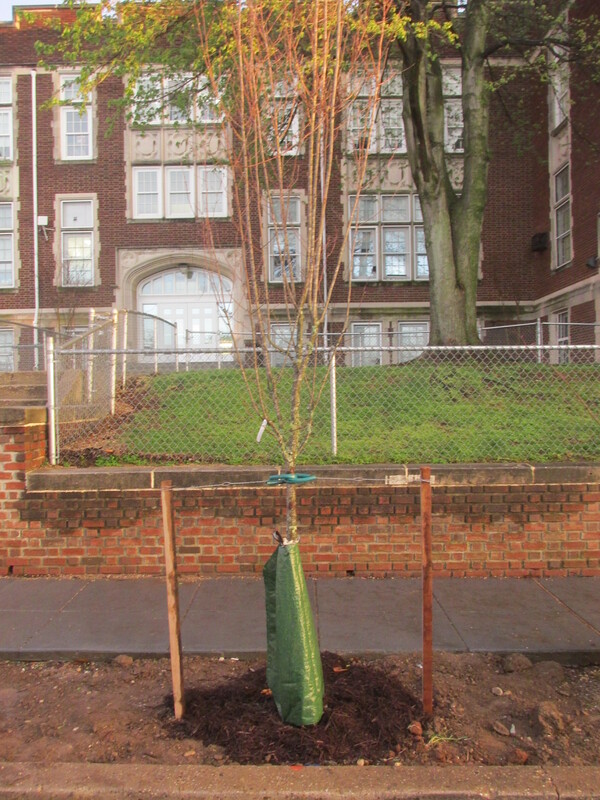 Finally, New Trees On Otis Place by School | Park View, D.C. It has taken a while, but I’m happy to report that there are now eight new trees planted on the south side of Otis Place between the school and the Park View Rec Center. 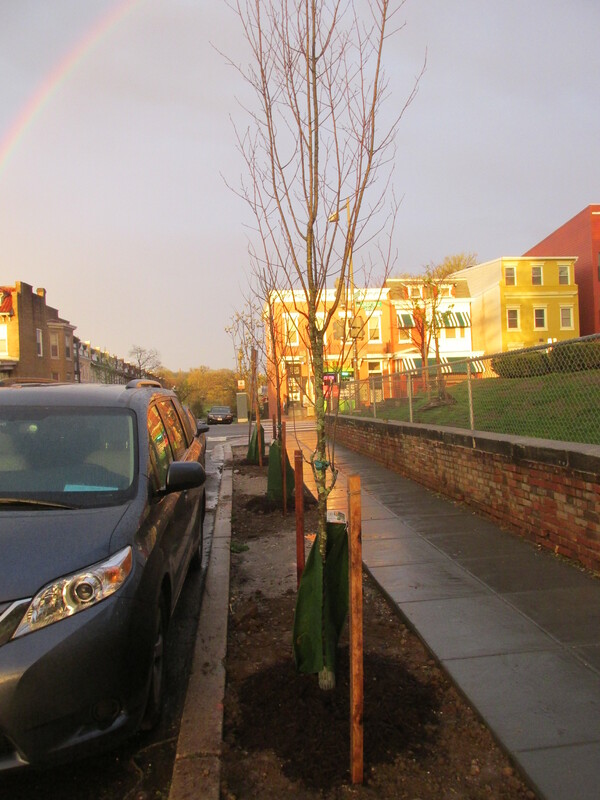 DDOT planted these trees on April 4th. Creating space for the trees took some doing, and began in early July 2015 when DDOT started replacing the sidewalks in this area. Initially the stretch of street between the school and rec center had no street trees, and DDOT had no intention of reworking the sidewalks to make room for trees. Yet, when I noticed the sidewalk work I immediately contacted DDOT and, long story short, collaborated with them to shift the sidewalks on Otis for these new trees. The next issue to tackle will be the space between the trees in the planting area. While there is now room for the trees, the area between them is dirt (or mud in rain) and DDOT doesn’t really address that. I’ll be looking for ways to plant ground cover between the trees so there isn’t a muddy mess there. Below is another view of some of the new trees. This entry was posted on April 7, 2016 at 10:01 am and is filed under Streets and Trees. You can subscribe via RSS 2.0 feed to this post's comments. Kent you are a hero and a true asset to the community. Thanks for your hardwork! Do you know what species they are? Who is responsible for adding water to those slow release bags? Looking so much better! I kind of wish that we could either pedestrianize/eliminate Otis St and extend the Park/add more of the heavily used fields/courts in that area. Empty blacktop isn’t particularly useful. Such a win-win for the neighborhood, thank you Kent. I’m very surprised DDOT doesn’t have funding to put in grass when it creates new tree boxes. I thought this was done on Princeton when the area was re-paved. There definitely needs to be something there!